Is this a suitable title for a deal from the first session of the round of 16 in the Mixed teams? I’ll leave you to decide, but it does at least involve the heart suit. When West decided against a two-suited overcall, the hearts were lost. 3 was comfortable, declarer losing a spade, a heart and a diamond. North led the 2 and South won with the ace and switched to the 8. Declarer won in dummy and ran the 7, North winning with the eight and continuing with the ace then queen of clubs. Declarer ruffed and ran the K, claiming when it held – a useful 11 IMP swing. South led a club and North won with the ace and switched to a trump, declarer winning with the ace and playing a spade to the king and ace. North exited with a trump and declarer won in dummy and played a diamond to the king and ace. He won the diamond return and cross-ruffed the back suits, setting up the J as a tenth trick along the way. At this table South’s initial pass gave him the chance to show a two-suiter and North judged well to bid on to 5 . 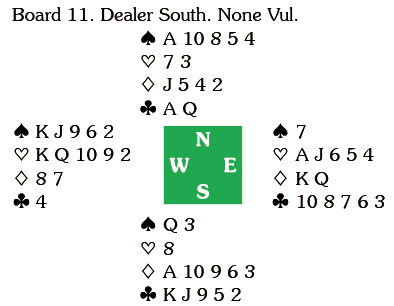 East led the K and declarer won and returned the ten, East taking the queen and fatally exiting with a spade, which allowed declarer to take West’s jack with the ace, unblock the clubs, cross to dummy with a diamond, pitch two hearts on clubs and then play a spade, establishing the ten as an eleventh trick for a 15 IMP swing. 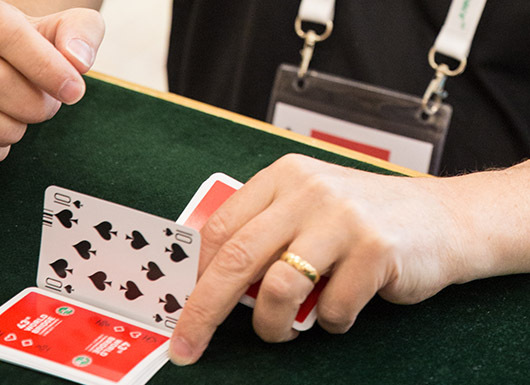 Six pairs made 4 , two of them doubled, while four pairs bid 5 – Liao being the only one to make it.